Michael Clark PhD. 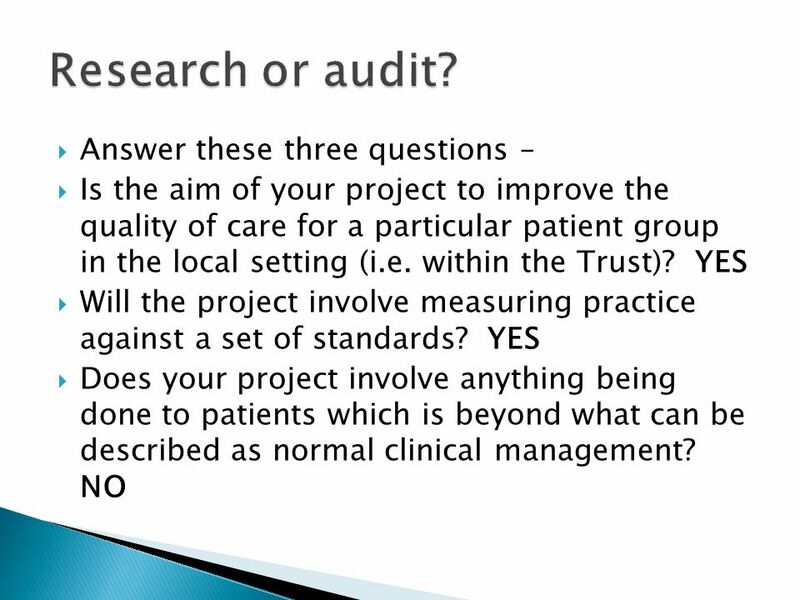  Both involve answering specific questions which relate to the quality of care.  They can both be carried out either prospectively. 5  Research is about creating new knowledge, about whether new treatments work or whether some treatments are better than others. 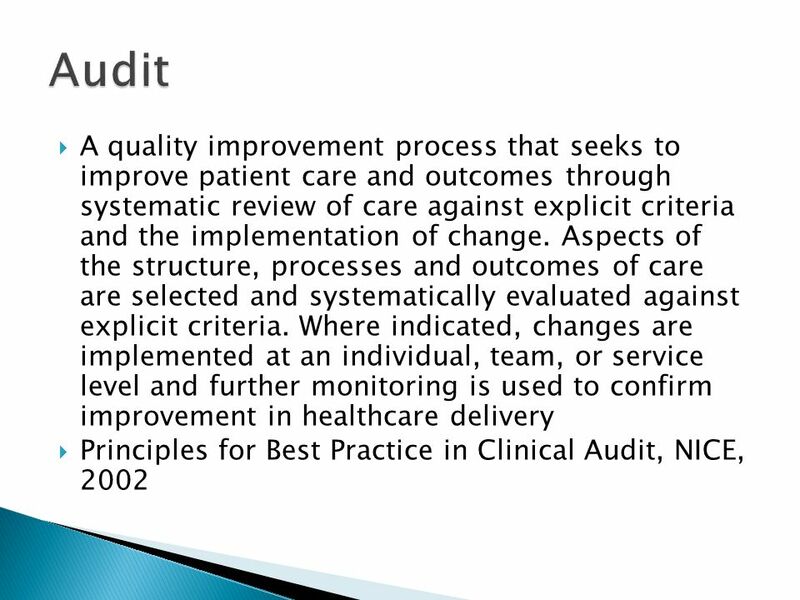 It determines what is best practice  Clinical audit is a way of finding out if we are doing what we should be doing. Are we following guidelines, and are we using best practice? 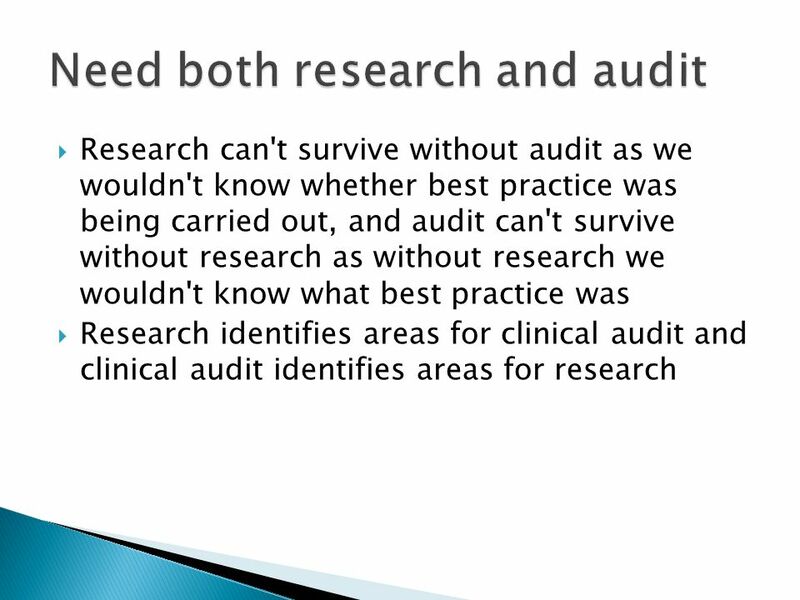 7  Research creates new knowledge about what works and what is best; clinical audit tells us if we are following best practice. 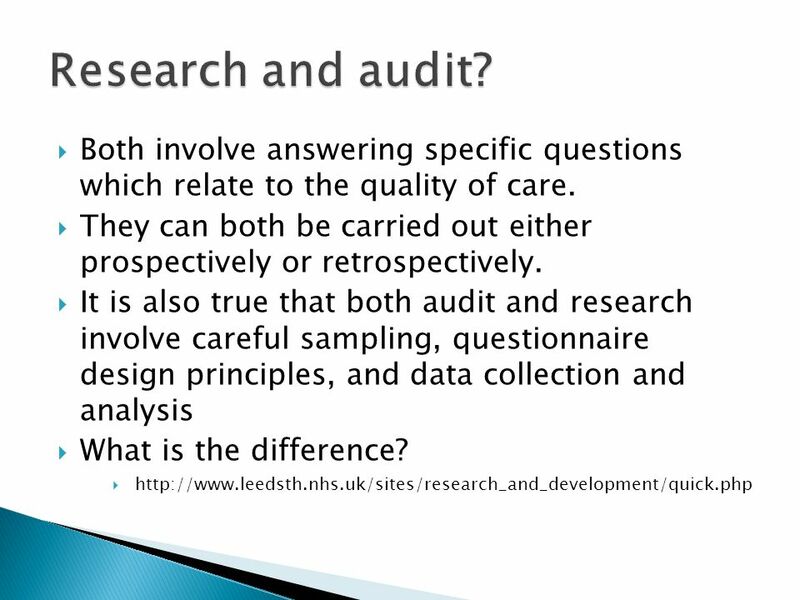  Research is based on a hypothesis; clinical audit measures against standards. 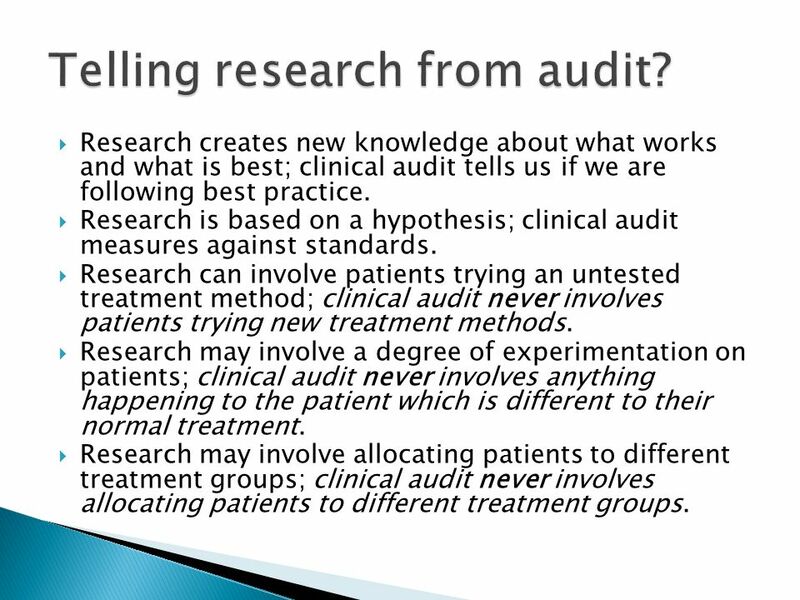  Research can involve patients trying an untested treatment method; clinical audit never involves patients trying new treatment methods. 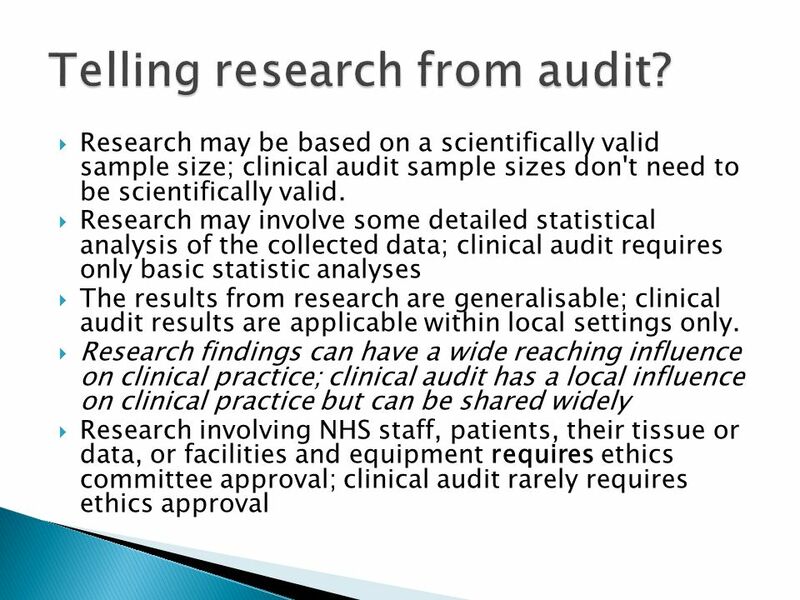  Research may involve a degree of experimentation on patients; clinical audit never involves anything happening to the patient which is different to their normal treatment. 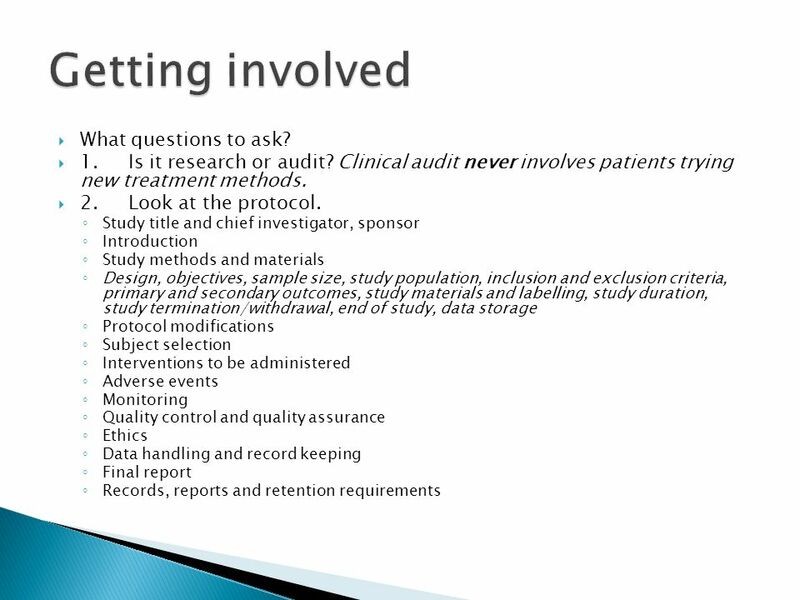  Research may involve allocating patients to different treatment groups; clinical audit never involves allocating patients to different treatment groups. 12  The framework is of direct relevance to all those who host, conduct, participate in, fund and manage health and social care research. It is not just for investigators, managers or any one professional group. 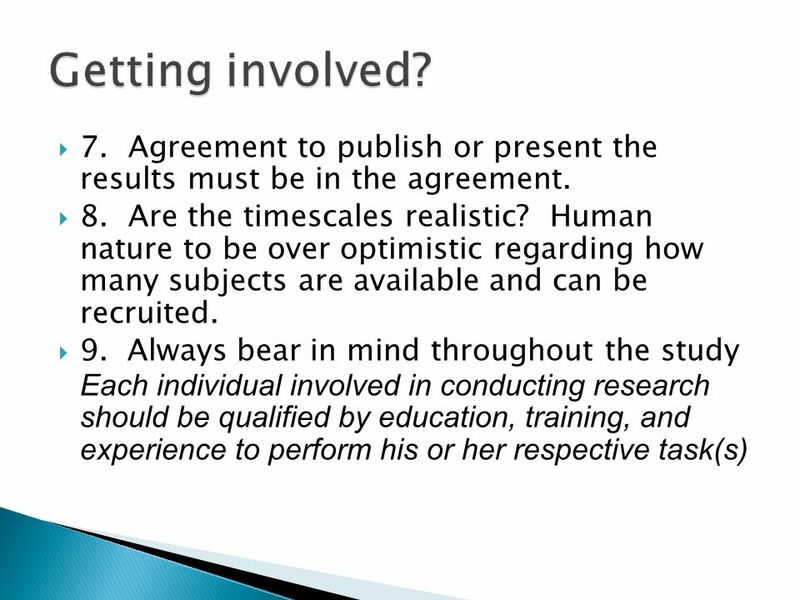 All service and academic staff, no matter how senior or junior, have a role to play in the conduct of research. 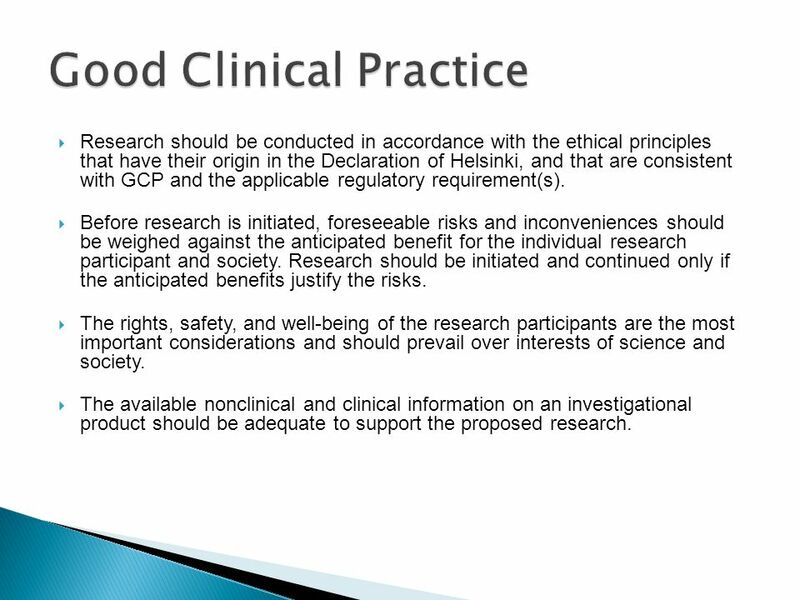 19  Research should be conducted in accordance with the ethical principles that have their origin in the Declaration of Helsinki, and that are consistent with GCP and the applicable regulatory requirement(s).  Before research is initiated, foreseeable risks and inconveniences should be weighed against the anticipated benefit for the individual research participant and society. 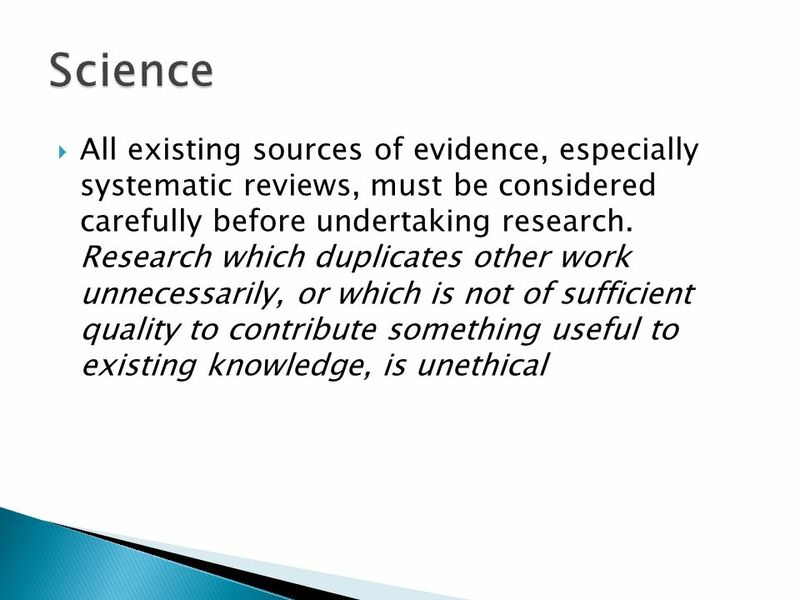 Research should be initiated and continued only if the anticipated benefits justify the risks.  The rights, safety, and well-being of the research participants are the most important considerations and should prevail over interests of science and society.  The available nonclinical and clinical information on an investigational product should be adequate to support the proposed research. 20  Research should be scientifically sound, and described in a clear, detailed protocol. 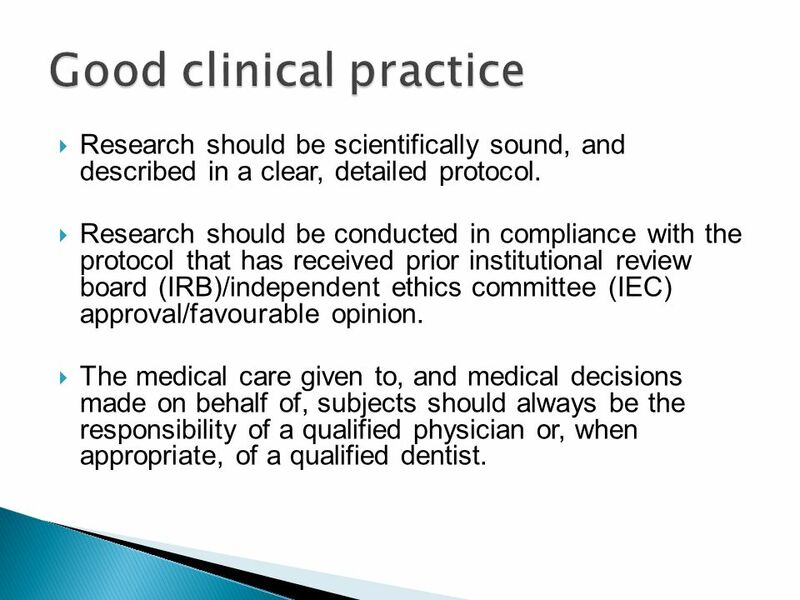  Research should be conducted in compliance with the protocol that has received prior institutional review board (IRB)/independent ethics committee (IEC) approval/favourable opinion.  The medical care given to, and medical decisions made on behalf of, subjects should always be the responsibility of a qualified physician or, when appropriate, of a qualified dentist. 21  Each individual involved in conducting research should be qualified by education, training, and experience to perform his or her respective task(s). 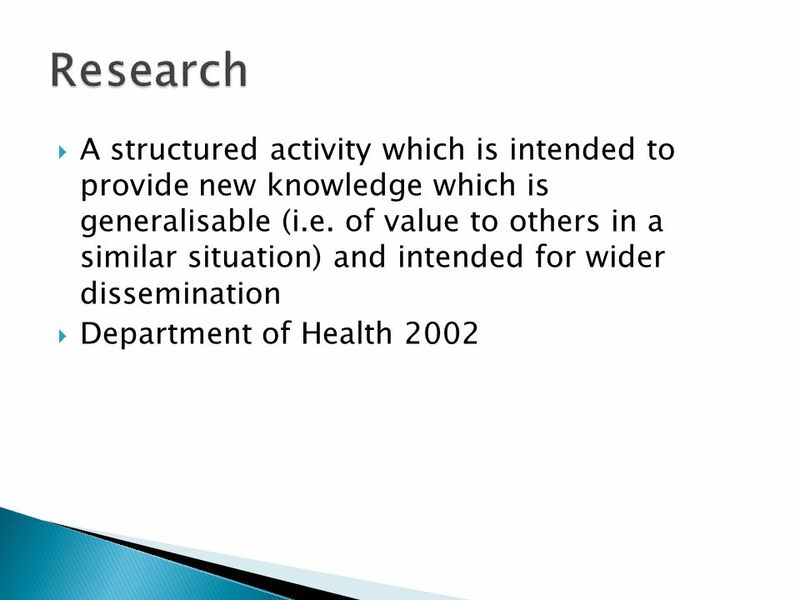  Freely given informed consent should be obtained from every subject prior to research participation.  All research information should be recorded, handled, and stored in a way that allows its accurate reporting, interpretation and verification.  The confidentiality of records that could identify subjects should be protected, respecting the privacy and confidentiality rules in accordance with the applicable regulatory requirement(s).  Investigational products should be manufactured, handled, and stored in accordance with applicable good manufacturing practice (GMP). They should be used in accordance with the approved protocol.  Systems with procedures that assure the quality of every aspect of the research should be implemented. 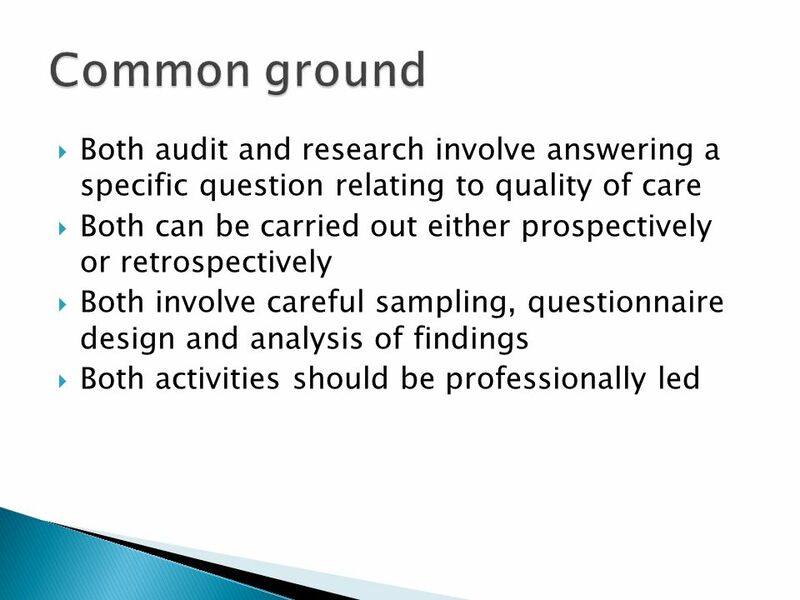 22  All those conducting health and social care research must open their work to critical review through the accepted scientific and professional channels. Once established, findings must be made accessible to those participating and to all those who could benefit from them. This may be through publication and/or other means appropriate to the type of research  Successful commercial development often depends upon the protection of intellectual property or commercial confidentiality at critical points in the innovation process. The timing of the publication of research findings needs to take account of this. 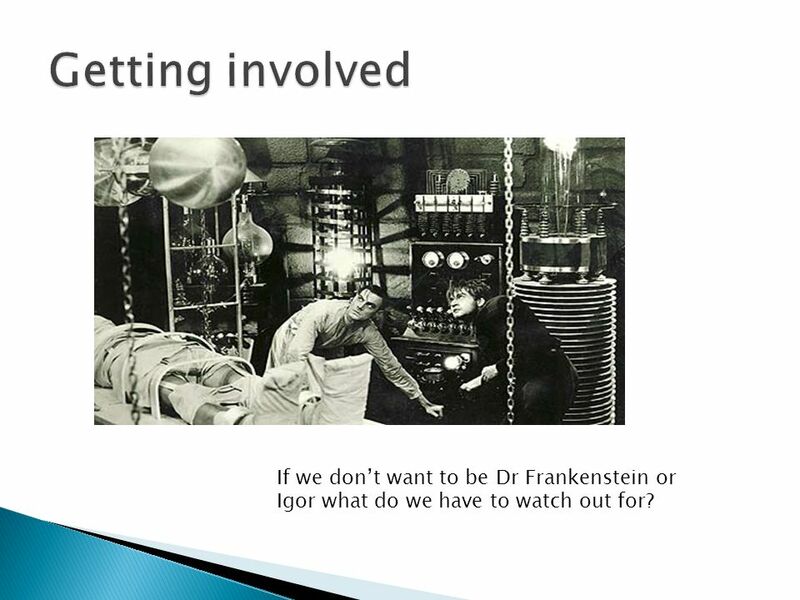 23 If we don’t want to be Dr Frankenstein or Igor what do we have to watch out for? 24  Most academic research today is carried out with multi-professional teamwork with little scope for single investigators  Educational research – MSc/PhD guidance and support with academic supervisors – USE THEM! 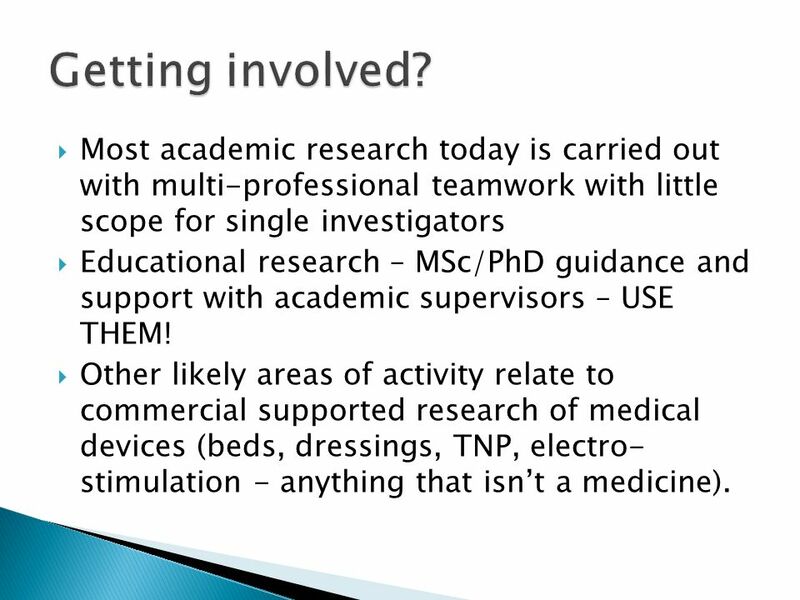  Other likely areas of activity relate to commercial supported research of medical devices (beds, dressings, TNP, electro- stimulation - anything that isn’t a medicine). 26  3.Write a protocol – chief investigator. 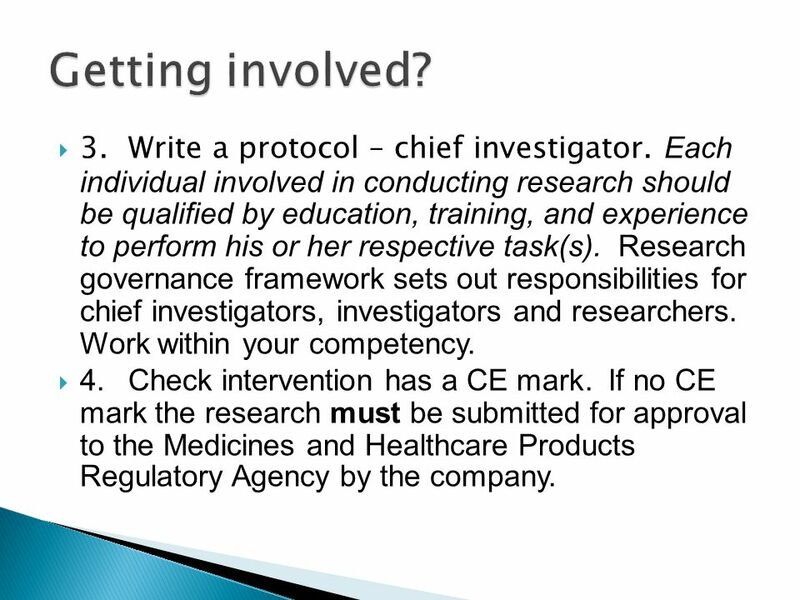 Each individual involved in conducting research should be qualified by education, training, and experience to perform his or her respective task(s). 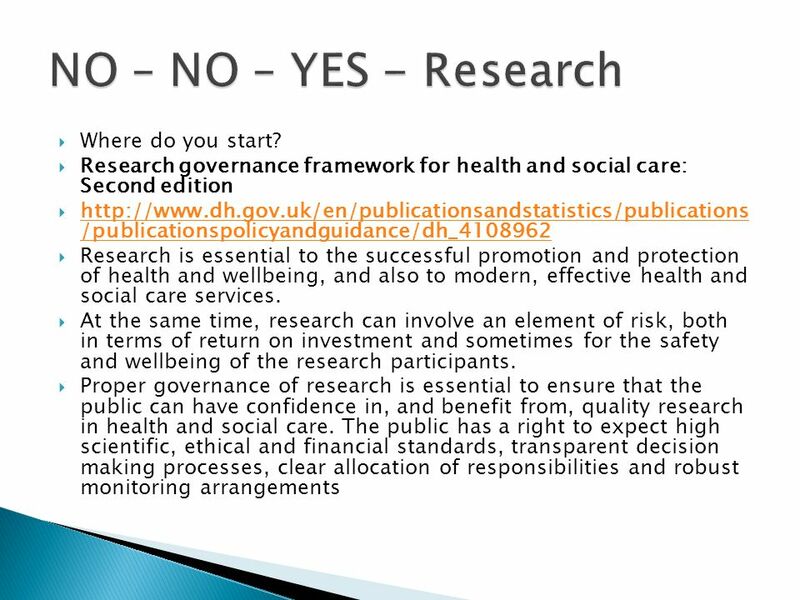 Research governance framework sets out responsibilities for chief investigators, investigators and researchers. Work within your competency.  4.Check intervention has a CE mark. If no CE mark the research must be submitted for approval to the Medicines and Healthcare Products Regulatory Agency by the company. 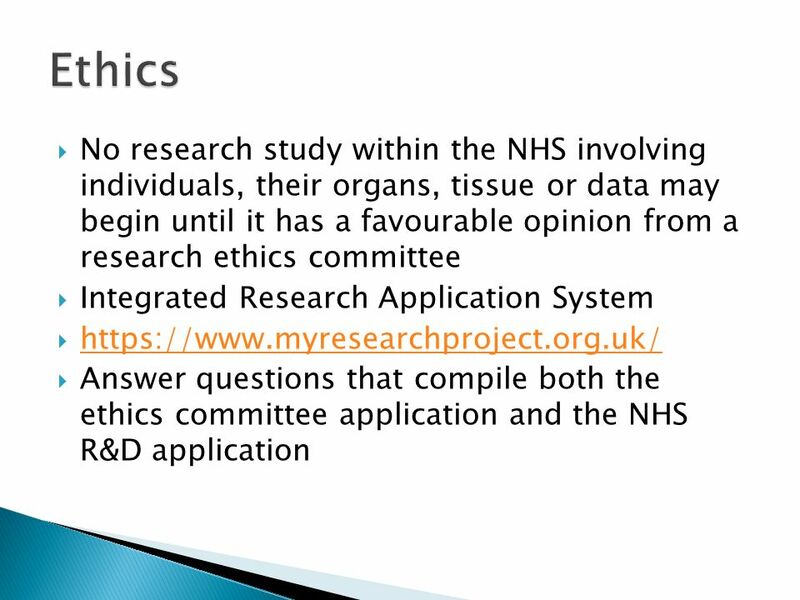 27  5.Submission to ethics and NHS R&D. Who is to undertake this? 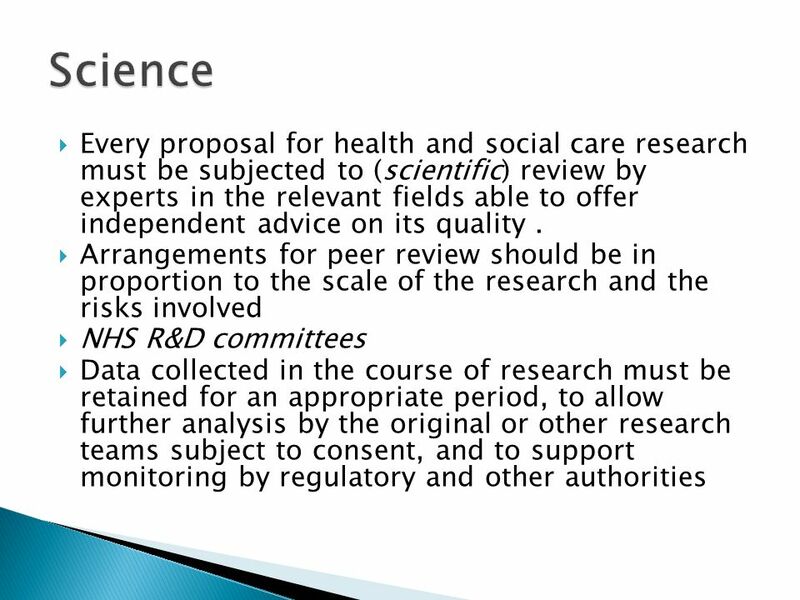 Submissions need to be signed by someone who can commit the trust to undertaking the study.  6.Financial agreements. 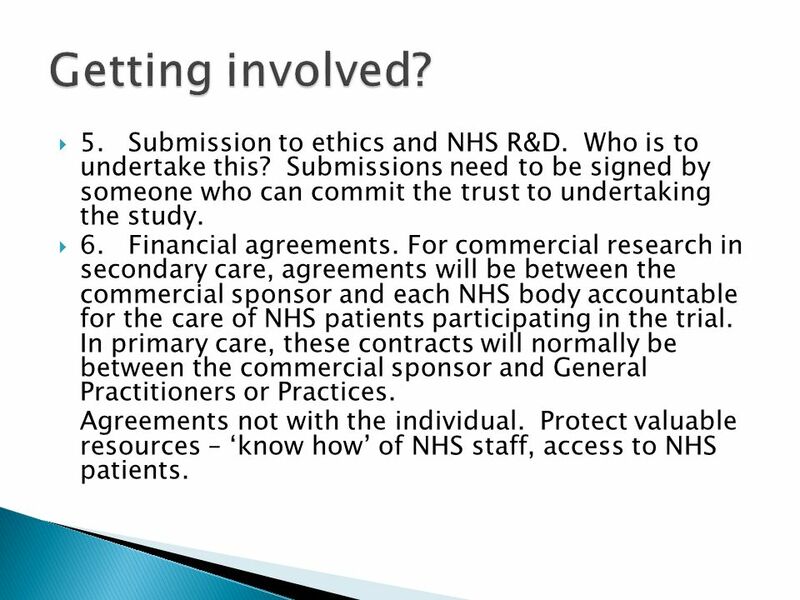 For commercial research in secondary care, agreements will be between the commercial sponsor and each NHS body accountable for the care of NHS patients participating in the trial. In primary care, these contracts will normally be between the commercial sponsor and General Practitioners or Practices. Agreements not with the individual. Protect valuable resources – ‘know how’ of NHS staff, access to NHS patients. 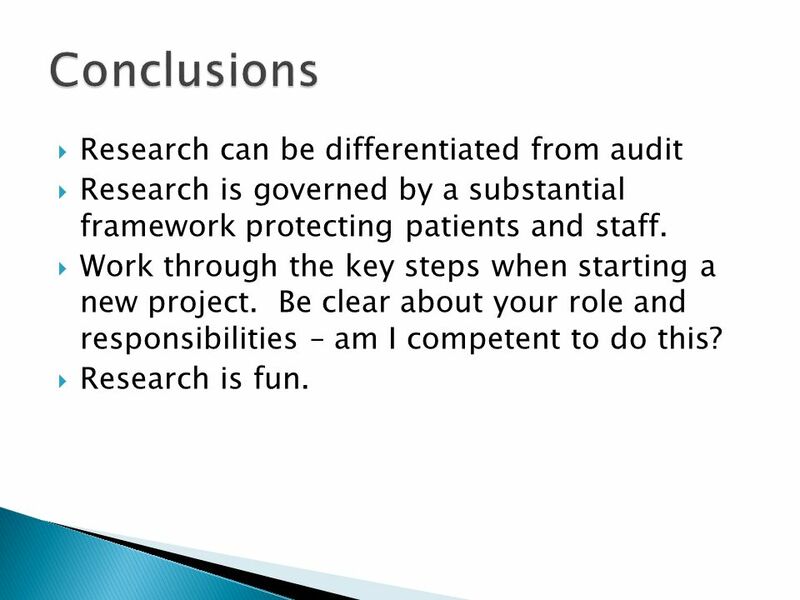 29  Research can be differentiated from audit  Research is governed by a substantial framework protecting patients and staff.  Work through the key steps when starting a new project. Be clear about your role and responsibilities – am I competent to do this?  Research is fun. 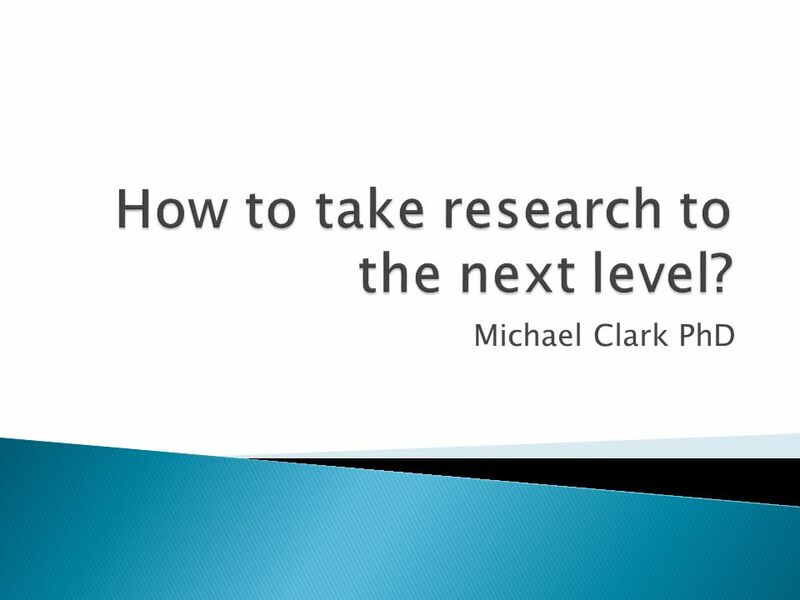 Download ppt "Michael Clark PhD.  Both involve answering specific questions which relate to the quality of care.  They can both be carried out either prospectively." The Role of the IRB An Institutional Review Board (IRB) is a review committee established to help protect the rights and welfare of human research subjects. Research Policy & Management RACD INTRODUCTION TO RESEARCH GOVERNANCE. Ethics – where to start! October 2013 Lois Neal FMS Research & Innovation Office. Honorary Research Contracts and the Research Passport Julia Miller Assistant Director of Research and Development NW SHA. An Integrated Care Organisation Incorporating the Community Services of Brent, Ealing and Harrow Dr Alfa Sa’adu Consultant Physician Medical Director and. 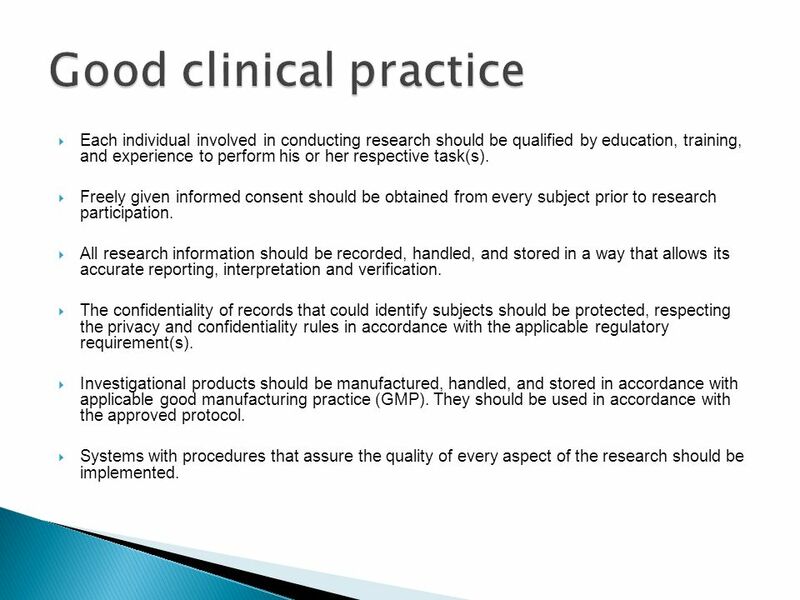 Good Clinical Research Practice Guidelines For Informed Consent Presented by Catherine May Acting Research Practice Development Officer The Office of Research. The Consent Process: It’s More Than Just a Form A “10 Minute Training” Brought to you by Cyndi Long, MS, RD, CCRC CU Sports Medicine. 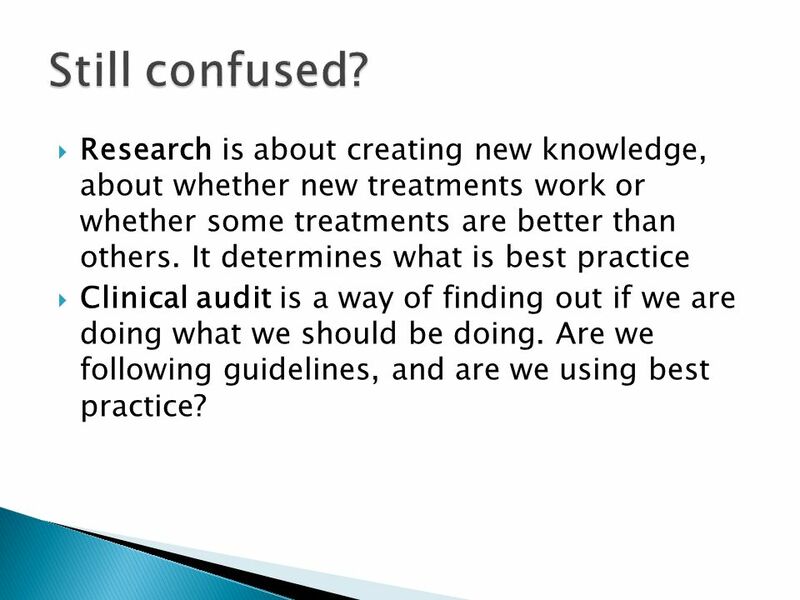 © Clinical Research Practice Clinical Research Organization and Management 1. 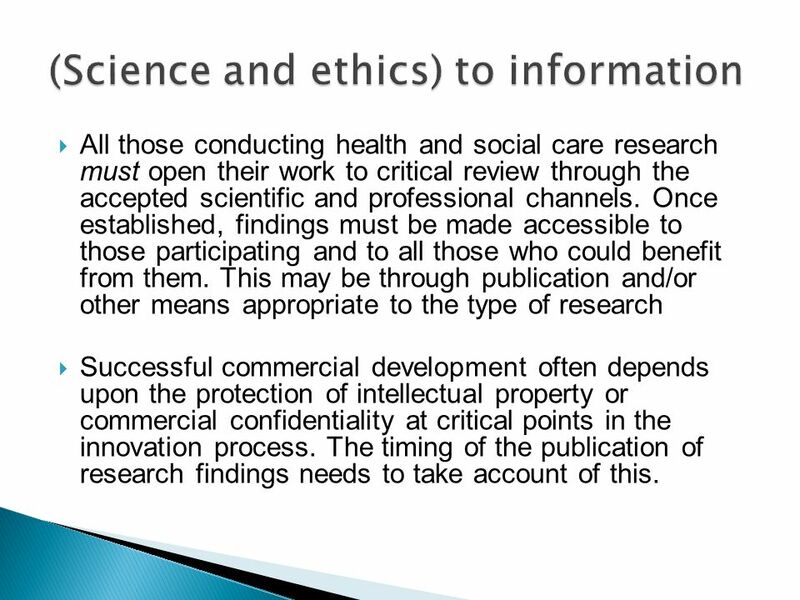 Ethical Considerations when Developing Human Research Protocols A discipline “born in scandal and reared in protectionism” Carol Levine, 1988. IRB Determinations 1. AAHRPP Site Visit Results Site visitors observed a real commitment to human subject protections Investigator and research staff. Harmonization - ICH Robert J. Temple, MD Deputy Center Director for Clinical Science FDA/Center for Drug Evaluation and Research SACHRP March 9, 2010. Obtaining Informed Consent: 1. Elements Of Informed Consent 2. Essential Information For Prospective Participants 3. Obligation for investigators. GCP compliance for GenISIS  This presentation is intended for clinical staff involved in recruiting patients to the GenISIS (Genetics of Influenza Susceptibility. ICH GCP, the MHRA and PATHOLOGY PATHOLOGY QUALITY ASSURANCE Rob Wosley MRQA SEPTEMBER 2009. Responsible Sponsorship A case study Dr Birgit Whitman, Head of Research Governance. 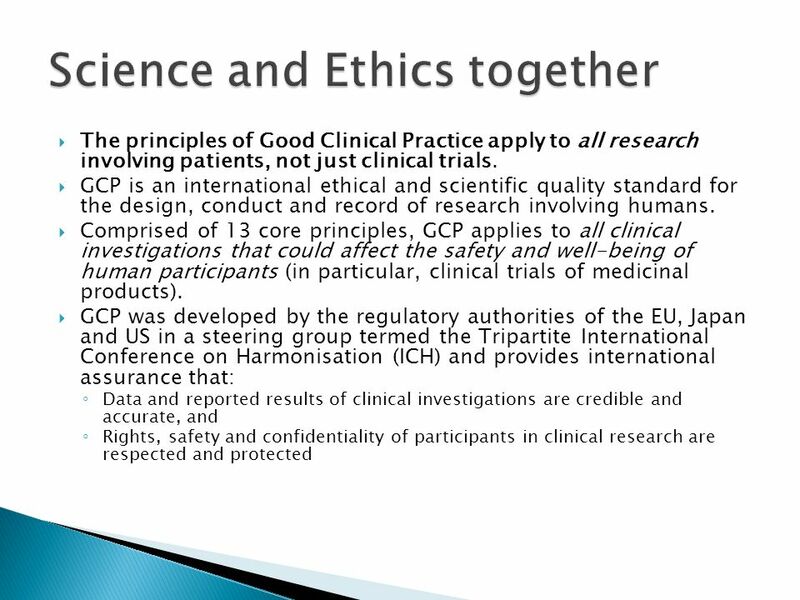 Www.theglobalhealthnetwork.org The Global Health Network Marijke Geldenhuys 19 September 2014 Adhering to the GCP Principles.. what does that even mean?